News from LMCU: Thanks for running and walking with LMCU! Thanks for running and walking with LMCU! The 2016 Lake Michigan Credit Union Bridge Run really packed the streets of downtown GR again this year! A record number of over 2,200 registrants signed up to run this popular event on Sunday, September 18. Every year, the Bridge Run’s memorable route runs through historic neighborhoods and over GR’s iconic downtown bridges. And mega-thanks to all the spirited LMCU members who joined us for this annual celebration of healthy lifestyles! 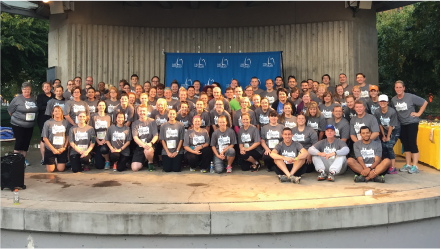 Lake Michigan Credit Union employees gather for a group photo before the start of this year's race.